If you are located in South OKC and are searching for Couples Therapy and Marriage Counseling services please contact one of our offices today. We are here to help your relationship. Couples in South OKC who are looking for couples therapy can call Marriage Solutions. A common misconception is that if you are seeking therapy, your relationship must be in serious trouble. Taking responsibility for your relationship and reaching out to a professional marriage therapist is really a sign of strength and means that you want to save or improve your relationship. We take a non-judgmental approach and have helped thousands of couples from all over the world to strengthen their relationship at any stage. Most of the time you just need an outside expert to guide you. We offer marriage counseling, but you do not have to be married to come to us for couples therapy. We have many clients in South OKC who seek help with their intimate relationships but the marital status of our clients varies. 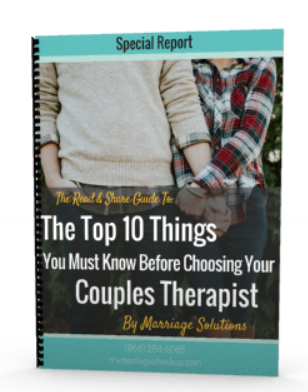 Couples therapy is useful to people who want to rebuild their relationships after a traumatic event, such as the loss of a child, the discovery of one or more affairs, a death in the family, left over relationship hurts from the past, and much more. Other couples come to see us because they want to prepare for a change, such as a change of employment status, the arrival of a child, or preparing for marriage. Whatever the circumstances, if you want your relationship to be as healthy as it has ever been and better, we have the training and experience to help you achieve your goals. When it comes to couples therapy, we ask you to come with an open mind. We are not here to take sides, to point out who is right or wrong, or to tell anyone to divorce. This is one of the reasons that many people find marriage counseling very helpful as opposed to the advice and support of friends and family. Having a support network is important and can be valuable for couples during hard times, but to move forward together it is often beneficial to have the help of an unbiased, non-judgmental, trained outsider. We will listen to what both of you have to say to ascertain what’s holding you back from complete happiness with your relationship. You may be surprised to discover strengths that you did not realize existed. Try not to worry about the possibility of bad behavior in front of a stranger. We have seen all kinds of things over the years and we are not going to be phased by what you share. On the contrary, we can help you to express yourselves in a way that is non-inflammatory, non-aggressive, non-threatening, and constructive. Our ability to help each person be heard is one of the great strengths of couples therapy with Marriage Solutions. The key really is communication. Even if you and your partner are still talking, ask yourself this, do you feel as though you are being heard? Do conversations tend to lead to arguments or resentment? This happens when there is a fault with communication at a basic level. It is a common problem and can be fixed with marriage counseling. Many couples who come to counseling with Marriage Solutions find an improvement in their relationship within a few hours. On establishing a basis for communicating feelings and desires, we will go deeper than basic communication skills that you can get from reading a book. What we help you discover is something that will help you for the rest of your lives. Understanding your partner and being understood are at the core of a healthy relationship. At Marriage Solutions, we believe that just about any relationship can be saved or improved. No matter how bad you think things are, for example if your partner has already left and does not want to be in a relationship anymore, we can offer practical solutions to turn your life around. Whether you need help with a small change or a full relationship rescue, if you live in South OKC and are in need of marriage counseling, give us a call to see how we can help you make positive changes in your relationship. With locations in Tulsa and OKC we also serve the Edmond, Moore, Norman, Yukon, and North OKC areas.